Conversation - The Finished Quilt. 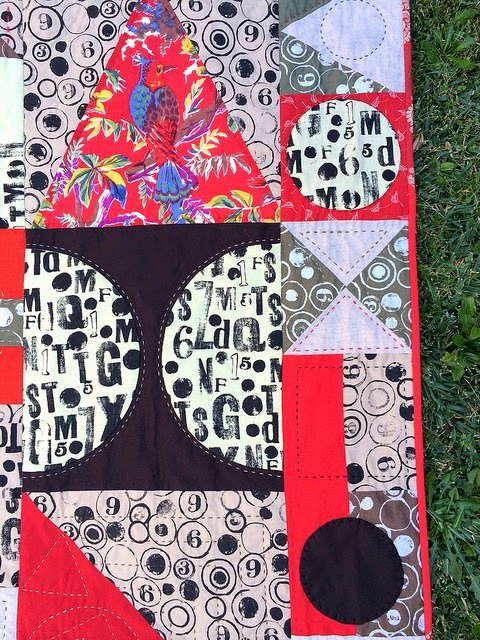 Conversation was the quilt I made to feature Jessica Wheelahan's wonderful Text/Type fabrics. I pieced big bold blocks to show off the fabrics. I included circles to echo the circles dotted throughout the Text/type fabrics. When it came to quilting I machine stitched in the ditch around the blocks to stabilize the quilt. Then I reached for my box of threads and that's when the fun started. I hand quilted using a mix of perle8, tapestry wool, embroidery floss and a mysterious grey thread that Jess found in an op shop. 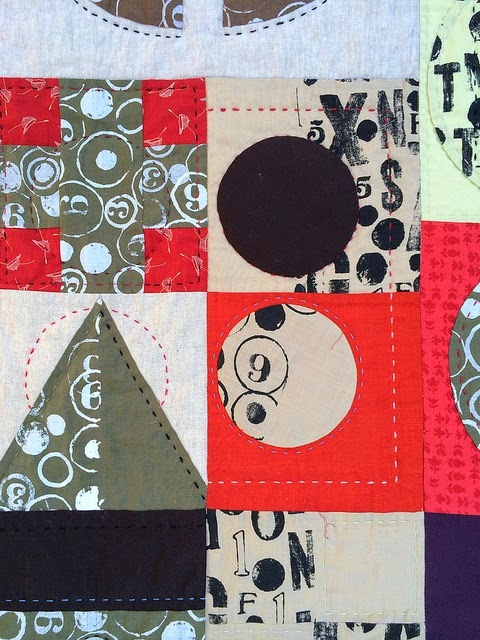 I continued the geometric theme of the blocks into the quilting, using circles, squares and triangles. With no overall plan, I just wandered from block to block and added whatever quilting I thought would look good for that block. To ancient Mongolia where quilts would come in handy on the cold windy plains. 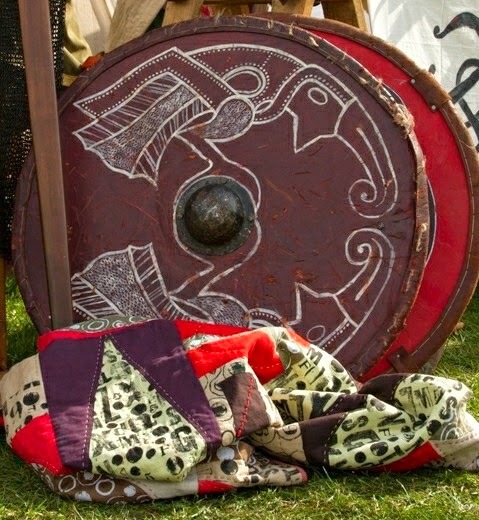 I found the quilt matched the colours of shields. I then travelled to medieval times. Could those shapes be a secret message like ancient runes of druids? 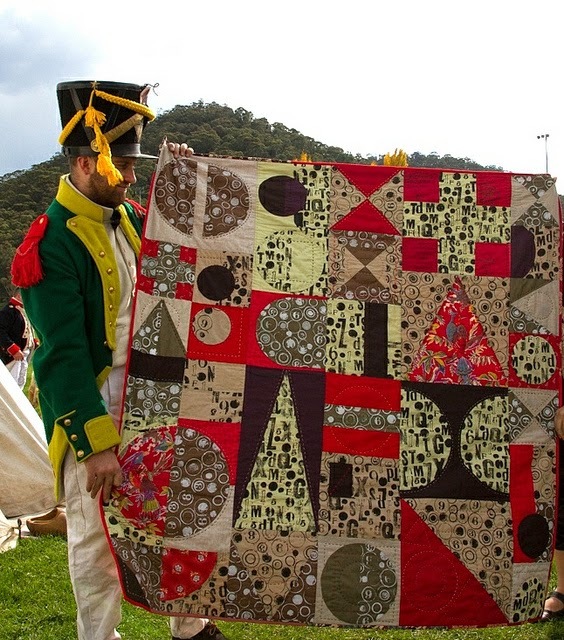 It's nice to have a man in uniform admire my quilt, especially one that has a tassel on his hat. 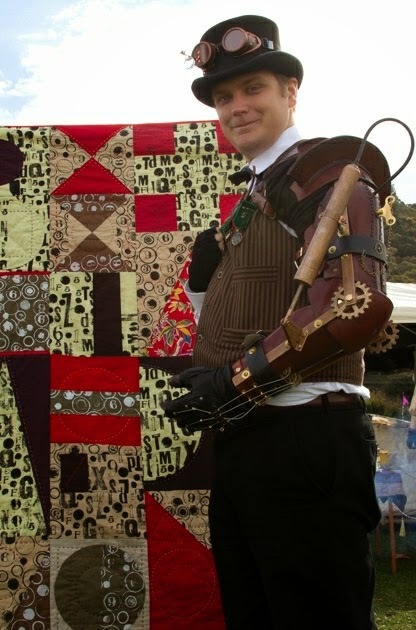 Steampunk is where old meets new. I can imagine the letters on the fabrics being printed on a big old letter press run by clockwork and pulleys. Let's leave history behind and take off into space. 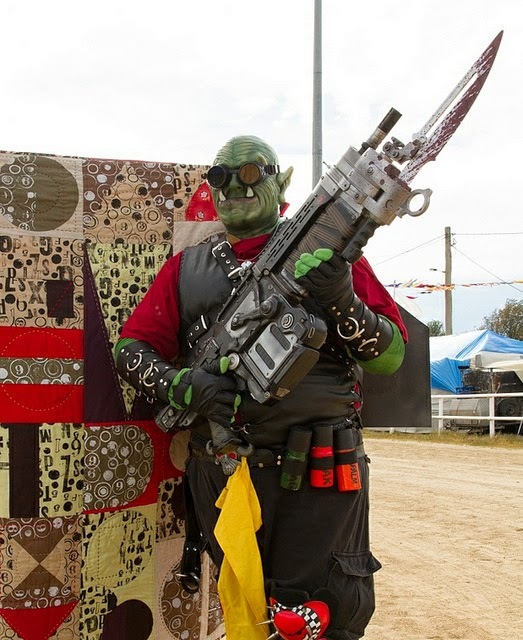 It turns out the quilt has just enough edge to attract a scary Space Orc. And I wouldn't argue with him! So there you go, it turns out it's a quilt that suits most times and places. A good Conversation starter, that's for sure. It's simple - just ask with a big smile. Featuring: Text/Type fabrics by Jessica Wheelahan, a super Sydney quilter and fabulous fabric designer You can buy Text/Type from Material Obsession. 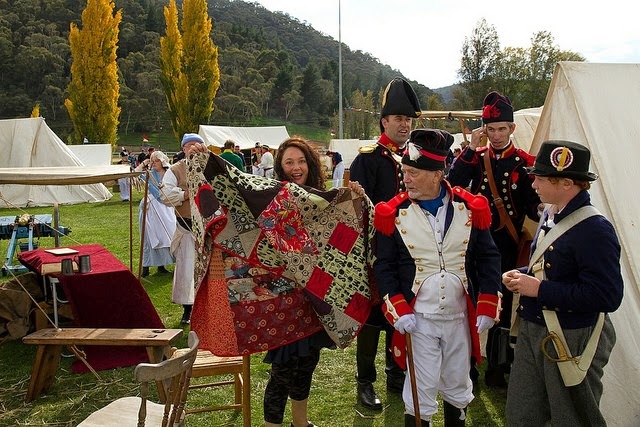 Photo Location: IronFest 2014, Lithgow, Australia. 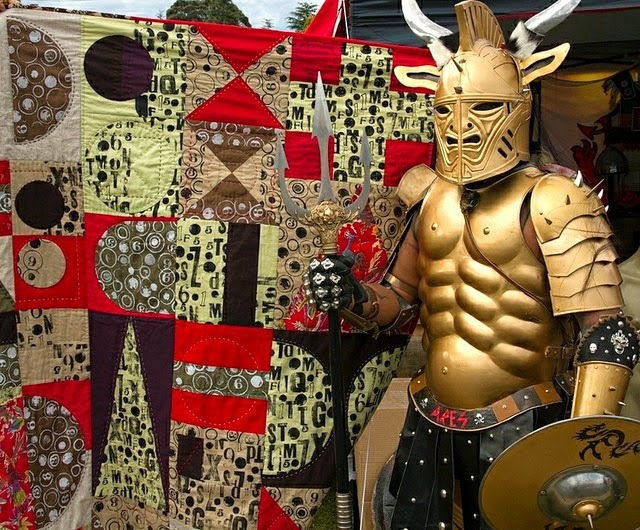 Thank you to all the wonderful people and aliens, and gold fantasy man who posed with my quilt. What a wild quilt! There's some fabulous fabric in there! And it looks like you had a wild time photographing it! What a super setting for your quilt photos! It is a wonderful quilt. 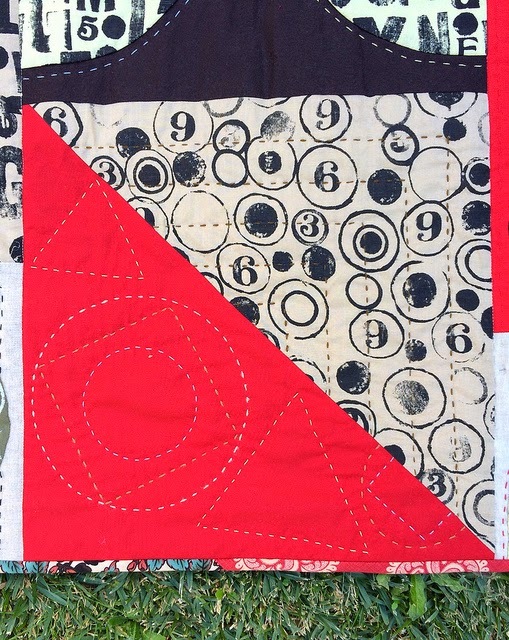 I can see this quilt in a book about your "early years" of quilting/where it all started. Now that made me laugh out loud...."gold fantasy man"! Your quilt turned out great and I so admire your hand quilting. You had way too much fun on this photo shoot! Another wonderful quilt Rachael ! The hand quilting you do is what makes them so you. Your "on location" photo shoots are such a great idea and look like fun for all. Congratulation on yet another spectacular finish ! You are adorable & the quilt is FABULOUS! It's Fantastic!!! I love all your supporting cast too -- perfect for your quilt! Hahaha! You are so cute, Rachael! When someone is as adorable as you,, it's easy to find helpers! I agree... It does have a mid-century feel! A great quilt and a fabulous photo shoot! What an awesome quilt! You made the unique fabrics the focus of the blocks which is a great choice. I like the stitching that you did. 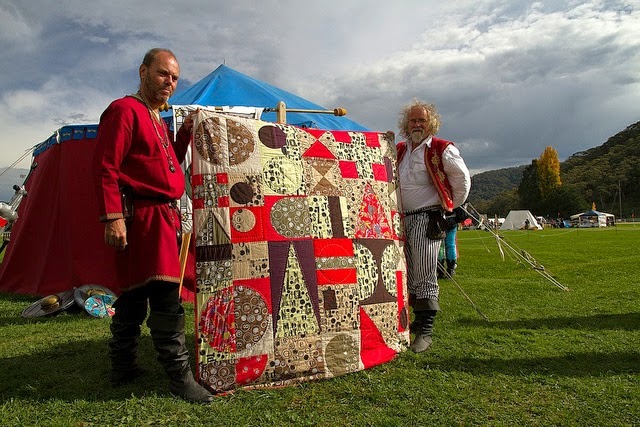 Great photos of the quilt ;-) It's good to have fun with it, isn't it? You certainly had a lot of fun taking quilt photos :) for some reason, this quilt makes me think of early Disney cartoons. I can't figure out why, but it's definitely a good thing - I like the quilt a lot. 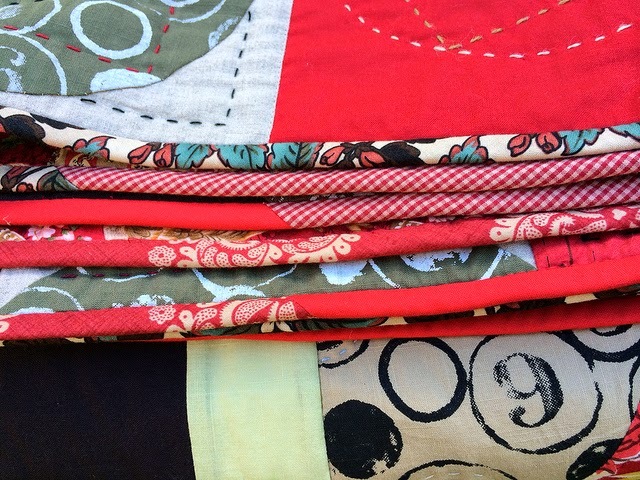 Particularly like your fun quilting, those tumbling shapes in the solid red are great! You are the coolest ever!!!! Brilliant pictures! Beautiful hand quilting and to me the quilt actually looks like a conversation! Yea! It's really wonderful. I love it with the space aliens. Congratulations on another absolutely stunning finish!! Your conversation piece is saying a lot of fun good things, especially with all those great pictures! Wouldn't argue with that man either! Love the quilt, Rachel. Congratulations on a finish! What a great setting for quilt photos! No shortage of models there. Quilts go with anything, anyone and any time. And you have great photos to prove it! You always delight with the photo shoots. LOVE, LOVE, LOVE the colours....how it fits with Medieval and Gold Space! Rachael this is just gorgeous and all posed with those Iron Fest fellas! Rachael, this is stunning. These blocks are fantastic with such interesting movement. The hand quilting is perfect. Beautiful as always! I've come to expect fabulous from you, Rachael, but this one takes the cake!! Absolutely fabulous - love it, love it, love it!! Gosh, no one would dare touch it with that scary space Orc on guard!! It's really beautiful. 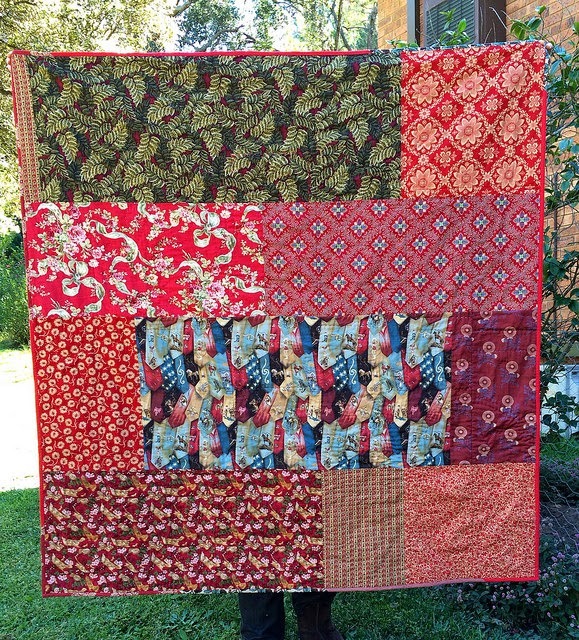 I love the quilting and those splashes of red with the birds on the them! That is a stunning finish. Your quilt shows off the fabrics perfectly. I love the work you have put in with all the hand quilting. It is amazing. 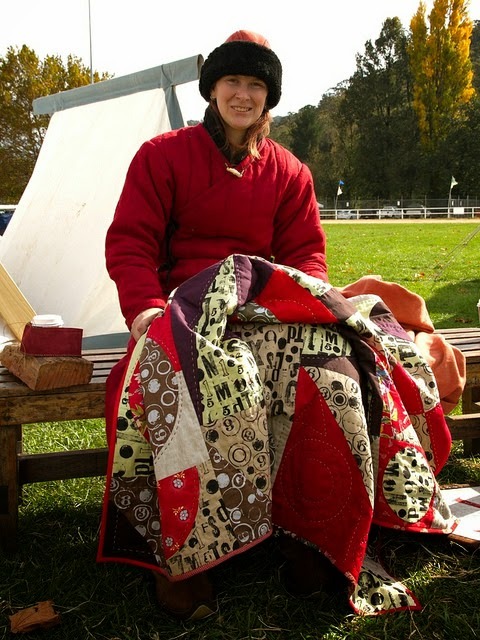 You have a wonderfully creative and innovative approach to your quilt making! 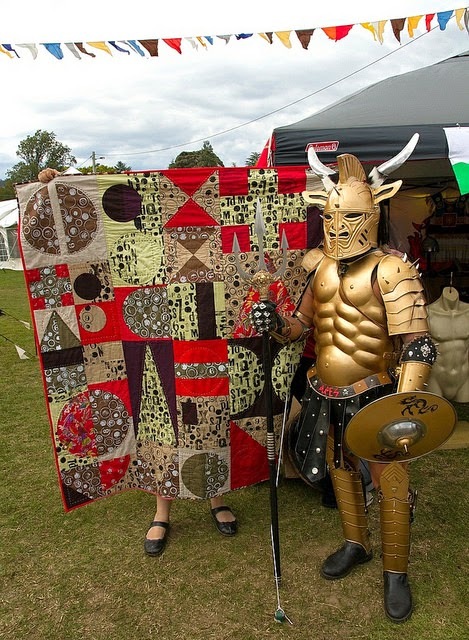 And the festival looks like it was the perfect place to showcase your special quilt! What fun! What a brilliant quilt! Love the piecing and, of course, the gorgeous hand quilting. 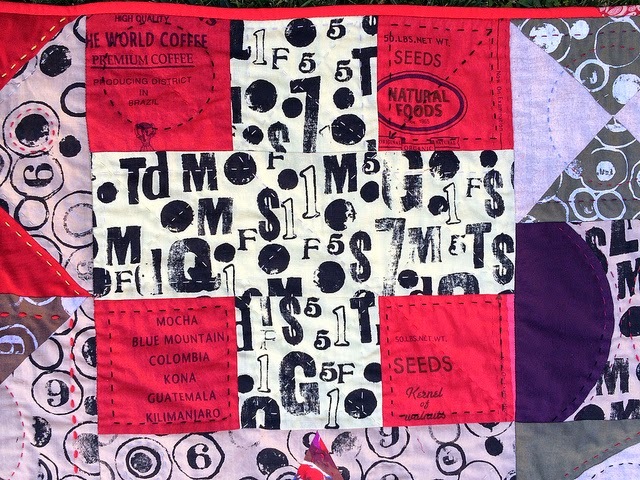 You were inspired to photograph your quilt in so many different eras! Marvellous! The quilt looks right at home whatever the historical or fantasy background. What a cool quilt! I love how you quilted it too. Fantastic! The quilt is gorgeous and I LOVE your hand quilting! It looks like you had so much fun doing this photo shoot! I love it. I think it really echos that steam punk vibe. I would totally go to a gathering like that - it looks like fun! 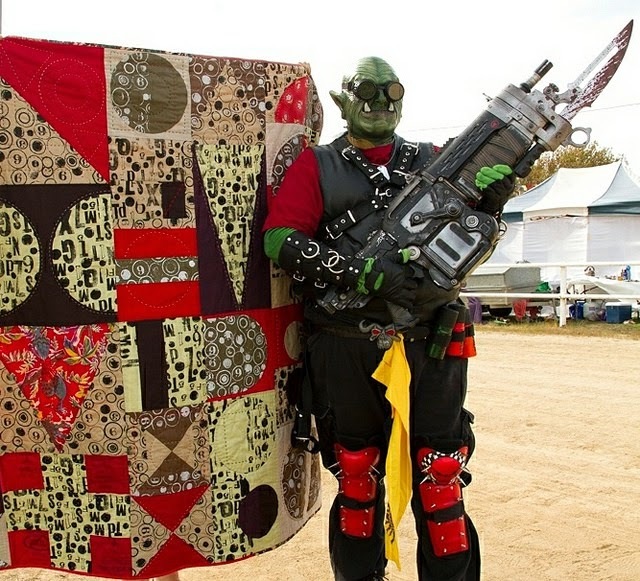 I love the image of the butch alien warrior next to the quilt. You can tell he needs a cosy quilt to snuggle up to after a hard day of slaughter. Beautiful beautiful quilt. Oh it is fantastic! 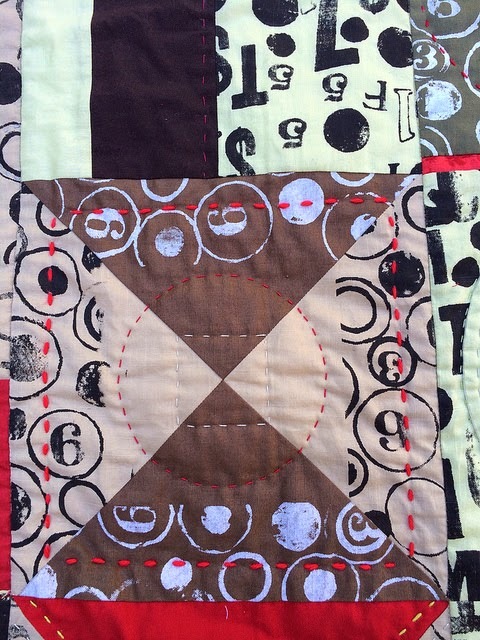 Your hand quilting is just phenomenal Rachael, I love the extra dimension it adds to an already interesting quilt. I adore those photos, too! It's stunning Rachael! Amazing use of fabric and blocks. I've not seen that "type" fabric before - its wonderful. How clever to have so many different people(?) post with your quilt! Congrats!! Bwahaha, I love that you had the balls to do that! That quilt is amazing- and the story you weaved for this post had me enthralled ! Just simply stunning. Great choice in design and reds make it! Just love it, both the quilt and the photo settings. Hilarious. I just adore this quilt!! 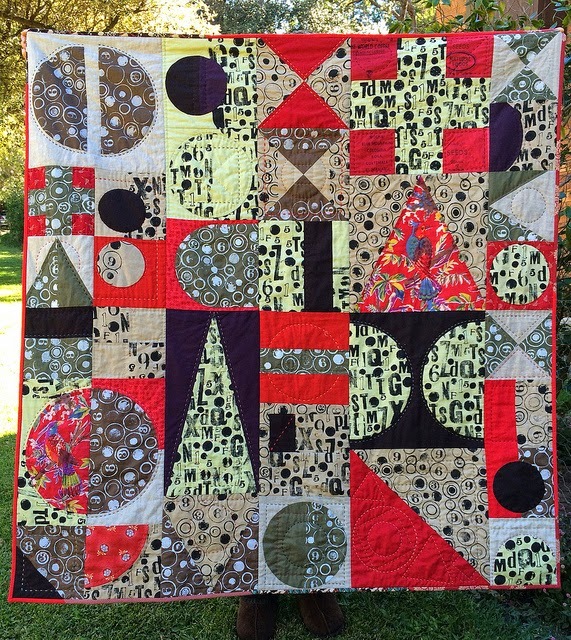 So glad to see it finally :) These fabrics, the text, the quilting touches-- really amazing and balance. And your show and tell back through the ages is fascinating. It really Is a timeless quilt!! OMG I love love your quilt! it is amazing and has such great movement and form. The back is fabulous too :) hooray for pieced backs!